Some readers may know that I’ve been on a radiofax adventure lately, after having discovered the beauty of WebSDRs and kiwifax.py. As a result, I decided to stop chasing the faxes from home – as it’s near impossible to get a good copy on distant stations outside intended coverage from a suburban environment with an S7+ noise floor. Instead, using the power of KiwiSDRs around the world, I would borrow their “radio” and antenna via the internet to decode the images at home. This way, I can preserve the charm of analog radiofaxes, examine the content and structure of transmissions from different stations and provide evidence of the activity and an example of the reception that could be expected for identification purposes. This seems particularly pertinent at this time, as the valve-based transmitter equipment has become difficult to maintain and the declining userbase with the advent of more affordable satellite connectivity has already resulted in the casualty of some weatherfax stations. In fact, the only previous Canadian fax I had received was from CFH, a station that appears no longer active since 2010. The charts on this page represent a snapshot of a previous reception and are not valid for navigation. They are not updated. Copyright of the faxed material belongs to the sender, in this case, the Canadian Ice Service of Environment and Climate Change, Canada. According to the NOAA/NWS shedule, VCO makes just five fax transmissions a day, all of which are ice analysis charts. The times are 1121, 1142, 1741, 2200 and 2231 UTC. As the transmitter is in Nova Scotia, Canada which is relatively high up north, finding good reception candidates is difficult. As a result, I did not spend much time to tune the slope (hence the skew) and it was not possible to receive examples for all charts. Reception of charts appeared best from VE3HOA and WA2ZKD’s KiwiSDRs – thanks for making your stations publicly available as I wouldn’t have otherwise been able to receive the following examples without them. 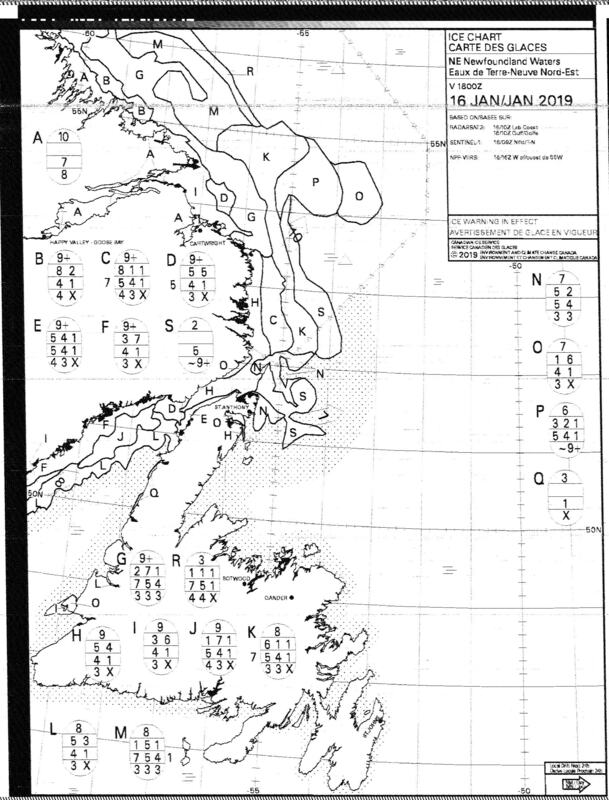 The above example is a chart sent at 2331UTC on 16th January 2019, an Ice Analysis for NE Newfoundland Waters. I’ve never seen such a chart, so I’m not sure what the bubbles represent – thickness of different layers of ice on the letter-coded areas? The chart itself is a single sheet sent portrait-wise. The first few lines after phasing have an encoded data pattern – this is common to American transmissions from NOAA as well but uncommon elsewhere. This is followed by a gradient bar from black to white, which is stepped rather than continuous. Sync region of the chart is black instead of white, another feature common to American NOAA transmissions, but uncommon elsewhere. The chart above is a chart sent at 2200UTC on 18th January 2019, an Ice Analysis for Gulf of St. Lawrence. This chart is sent “tall” to maximise resolution, but the contents are in a landscape form due to the coverage area. The final example is the same chart from the 16th, instead, as received on the 18th with some slant correction applied. This was my first time hearing VCO and receiving their faxes. Because of their location and limited transmission schedule, opportunities to receive it from home were practically zero – but thanks to VE3HOA and WA2ZKD’s KiwiSDRs, I was able to receive the above charts which provide evidence that VCO is active and provide some examples of ice charts which I have never seen before. 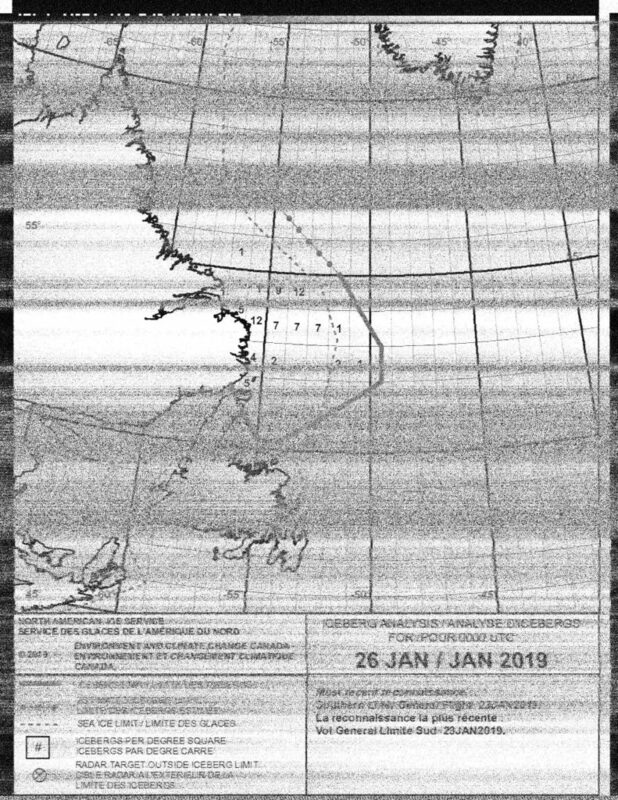 Unfortunately, due to the propagation characteristics, I wasn’t able to get a “readable” copy due to doppler spreading although the 1121 and 1142UTC faxes were audible. As these charts are just repeats of the 2200 and 2331UTC charts, the format of the content is assumed to be the same. 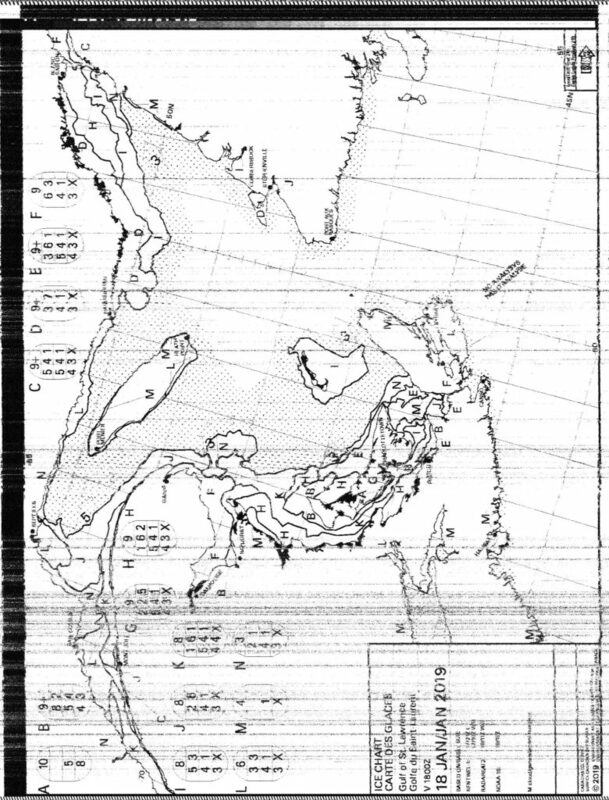 The only fax from VCO I haven’t seen is the 1741UTC Iceberg Limit chart. 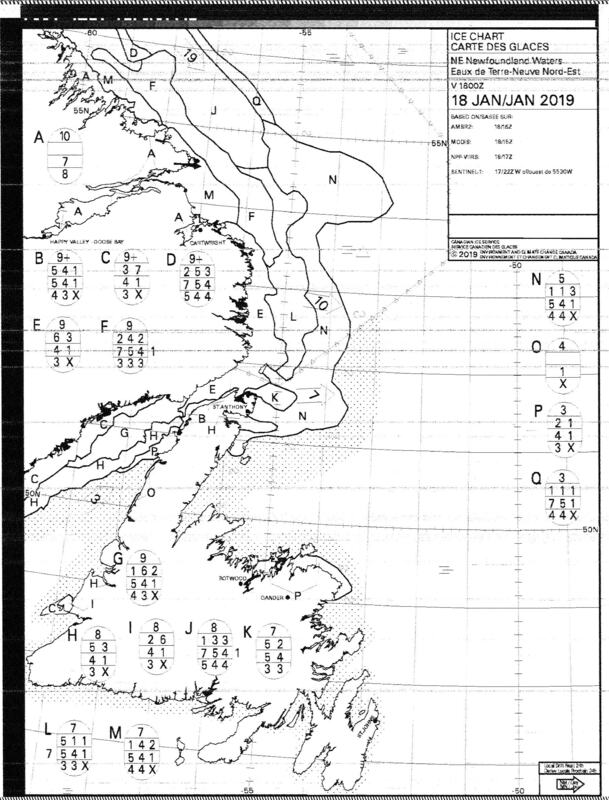 Over the evening, I was fortunate enough that monitoring via WA2ZKD was able to produce the 1741UTC Iceberg limit chart, although with much fading. The reason for not being able to see it before is likely due to the fact I wasn’t awake to manually receive it at the time of transmission (about 4:41am in Sydney) and the start tone must have been too faded for kiwifax.py to recognise. The stop tone was too faded, so the chart timed out on max-height and was cropped to length afterward. 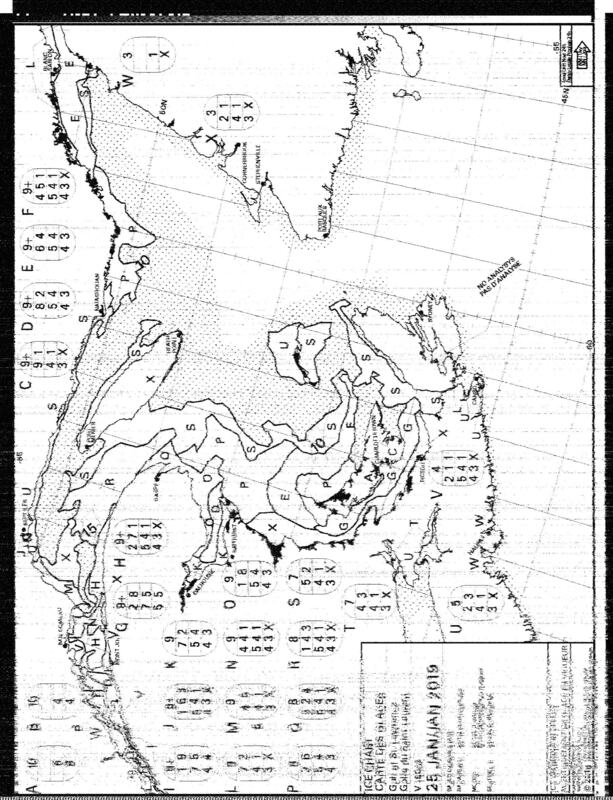 The chart is in portrait orientation with thick outlines around land areas and a legend area at the bottom of the chart occupying almost a quarter of the height. The 2200UTC chart was also received on 26th January, on 4416kHz which suffered some doppler spread towards the end resulting in a fuzzy picture. This confirms that the 22xx UTC charts are of the same format as those received above.